The Genoa area of Italy is mostly famous for pesto and basil. With that said, Liguria is famous too for using green beans and new potatoes in many of its dishes (see for example, this lasagna recipe). I made this pie from Marcella's book, and it turned out tasty - it'd go great alongside a hunk of meat and its drippings. It's probably not something that can serve as a main dish like her swiss chard torte. The recipe goes as follows: 1/2 pounds of new potatoes, boiled then mashed. 1 pound of green beans, boiled in salted water, then chopped very fine. Combine in a bowl. Add to this 2 eggs, 1 cup parmigiano cheese, and 2 teaspoons chopped marjoram (if fresh, 1 tsp if dried). Mix well. This mixture goes in a springform pan that has a) been lubricated with olive oil and then b) breadcrumbed evenly to act as crust. 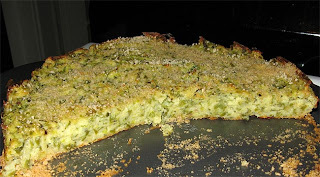 Top with more breadcrumbs and drizzled olive oil. Bake for 1 hour, top rack of oven, at 350 degrees. Let stand 10 minutes before serving.